Not content with a virtual monopoly on broadcast, UK giant Arqiva has bought Connect TV, the outfit that has been slipping IPTV channels into the Freeview Electronic Programme Guide for the last year. Neither company will say how much the UK broadcasting services firm paid for Connect TV, but reps from the company did admit to a "champagne-fuelled haze", so we can assume the deal was beneficial to the London-based start-up. 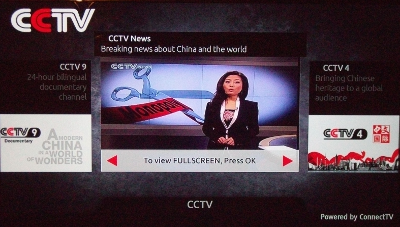 Connect TV started streaming internet television into standard Freeview boxes last September. Connect TV runs channels above 100 in the Freeview EPG, which (once selected) are streamed over the internet rather than broadcast. It's able to do that thanks to the "Freeview HD" specification, which mandates MHEG-controlled video streams – allowing not only video-on-demand but also channels within channels, selected by carousel. Customers include previously internet-only operations such as Sports Tonight as well as channels such as CCTV and The Christian Faith Network, which have limited demographic appeal. Its biggest customer is Vision TV, which delivers several language-specific services over the platform, but it isn't expecting the acquisition to impact that service. The viewer numbers are tiny – one needs an up-to-date Freeview HD box connected to broadband link supporting a few megabytes... and even then it's something of a lottery – but the potential is enormous, and Arqiva is clearly in it for the long term. It's not Arqiva's first foray into IPTV. The SeeSaw platform provided streaming video to computers, populated with content from Channel 4 and BBC Worldwide, but being stuck on a computer was fatal. Arqiva managed to get shot of SeeSaw last year, selling it to a consortium which ran it into the ground within six months. Arqiva is also involved in YouView, the set-top platform delivering content from existing broadcasters, but the first YouView box is only just out and the platform needs to get cheaper to be more widely adopted.